This month is all about the crafts. That’s because March is National Craft Month! If you’re a big fan of glitter, glue, and getting your hands dirty making something amazing, then take part in the celebration with some of these top springy crafts. 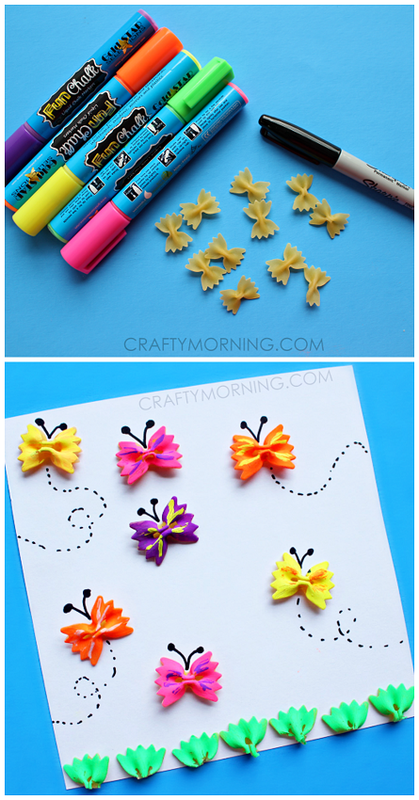 Using dried pasta for decoration and craft time is something kids have been doing for years. We were pleasantly surprised to find this fresh rendition of a classic: butterfly bowties! With markers, dried pasta, and really just a few bucks spent, you can create a beautiful and lively craft to hang on the fridge or front door to welcome spring. And to take part in this craft-acular month too, of course! Snow globes are out. Flowering tree terrariums are in! This wonderful spin on a terrarium uses brightly colored tissue paper, twigs from the back yard, glue, tape, and a mason jar (or any glass jar), to make a little biome of beautiful colors and textures. Get your kids together this spring to make these wonderful terrariums. You can use them down the middle of the kitchen table as a fresh and fun centerpiece or even put them up on the mantel for a springtime display. The colors and purpose are up to you! Have some leftover pinecones from Christmas or winter centerpieces? 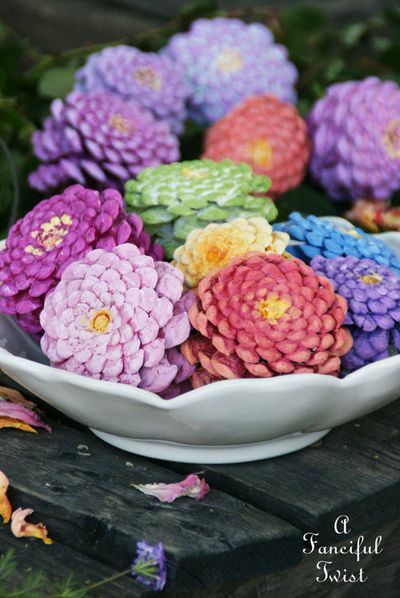 You can give them a fresh coat of paint for spring and transform them into pinecone zinnias! These particular pinecones are almost unrecognizable in this vibrant state. Choose similar colors to this crafter’s version or paint them in pastels or more saturated hues. Once you’re done, you can pile these into a bowl for a centerpiece, put them inside glass vases around a candle stick, or scatter them on the mantel for a springy look. Even glue them onto a wreath for a fun front door decoration. Flowers fade rather quickly. Not this tissue variety though! By following this tutorial, you’ll learn how to grow vibrant blossoms in your own home and hold onto them for years to come. 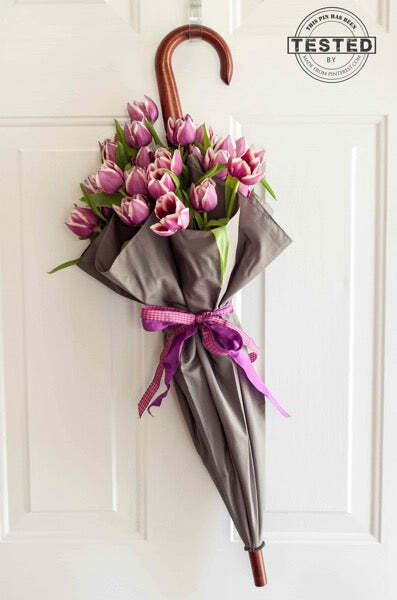 Arrange them in a bouquet like this, glue them to a wreath that will stand up to the test of time, or give them to friends and family with Easter baskets. You could mix in other decorations too like plastic butterflies or sparkly stems from the craft store. Even make a statement at a wedding by having the flower girl walk down the aisle with her very own bouquet! Spring has sprung. It’s about time to get those garden hoes and weed wackers out. that’s why this is the perfect DOY craft for National Craft Month. Grab some rocks from the playground or your own back yard, paint, and paint brushes. Choose the colors you like most and paint on the plant varieties you plan on sowing. 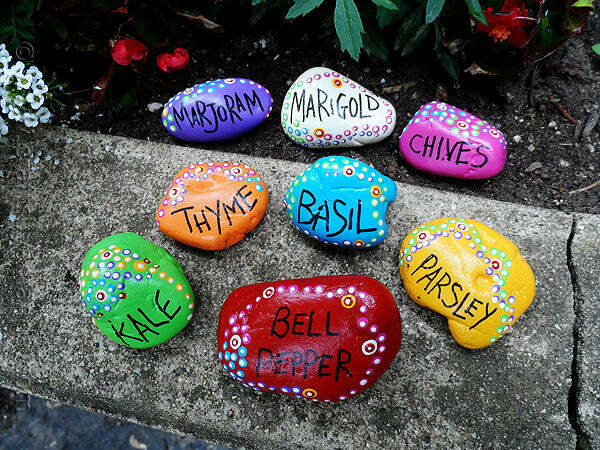 Once you make these fun garden plant markers, you’ll know what’s what when seeds start sprouting and they won’t get ruined in the rain or wind. Ever been on a cruise or to a hotel where they put an animal-shaped washcloth on your pillow? If you’re having guests for Easter, this is a cute way to dress up their pillows at home and make it feel like a 5-star resort! It doesn’t have to be Easter either. If it’s springtime, you can surprise your kids with these and give them something to cuddle with during the night. Springtime means little critters hatching and coming to life. 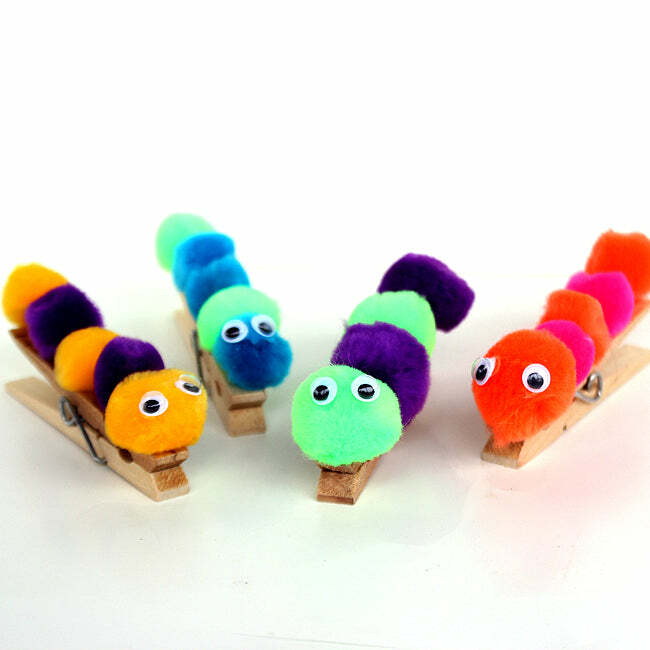 Bring some of your own to life in your home by trying this caterpillar craft. With some colorful pompoms, googly eyes, glue, and clothespins, you’ll have an adorable thing to close up lunch bags with or use to hang laundry out to dry. If you glue a magnet to the back of these caterpillars, they can even be used to display art or photos on your fridge. Bottom line is that this is a super quick, cute, inexpensive, and easy craft for National Craft Month that the whole family can take part in. The evergreen wreaths of Christmas and winter have probably been thrown to the curb, so it’s time to spruce your door up with another type of wreath: a springy one! This DIY video will walk you through how to make a wreath with springtime accoutrements. You can make it more general by omitting the Easter eggs or load it up with bunnies, chicks, and eggs. The best part of a craft like this is that it shows you how to construct the wreath, but what you choose to tack on is totally up to you! Birds are beginning to chirp and flit around from budding branch to budding branch. 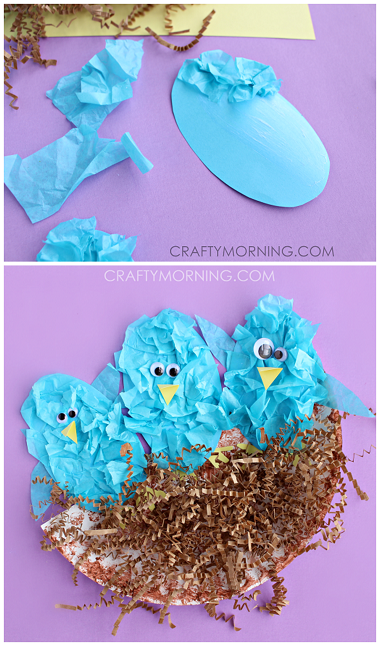 Hatch a family of your own by creating this bird’s nest craft. This particular craft features bluebirds, but you could make robins for an even springier feel or other warm weather birds that are native to where you live. Slap a magnet on the back of this for a cute craft for the front of the fridge or mount it in a frame and put it on a wall or mantel while the temperatures begin to heat up outside. Just set out the supplies on the kitchen table and let your kids go to work making their own cute little bird families. Plastic planters from the store can be a bit of a snore. Why not dress them up with some paint and tape? This tutorial will walk you through their take on spring planters, but you could use this idea to transform other planters into beautiful, flower-worthy pots. Try doing this for a party or even make small individual pots full of succulents to give away as party favors. April showers bring May flowers. Celebrate that famous rhyme by making this beautiful umbrella wreath. If you have a cute umbrella that has some holes or is broken, don’t chuck it! Use it for this craft. You can also sub in a vintage parasol (if it’s on a covered porch and won’t get wet) or take a trip to the local thrift store to see what’s there. Also, this tutorial uses real flowers, but to keep this wreath blooming year to year, we recommend some faux flowers from the craft store. Once you’re done with this umbrella, don’t forget to pack yours with you so you don’t get stuck in a downpour! This is one cute craft you’ll have to try! Either purchase some pre made flowers or cut some out yourself out of colorful and patterned scrapbook paper. Mount them all together in the letter of your choice and you’ll have a beautiful and fantastic spring craft in a snap. The great thing about this is that it could go above your mantel or be used as a wreath on your front door if you use the letter for your last name! 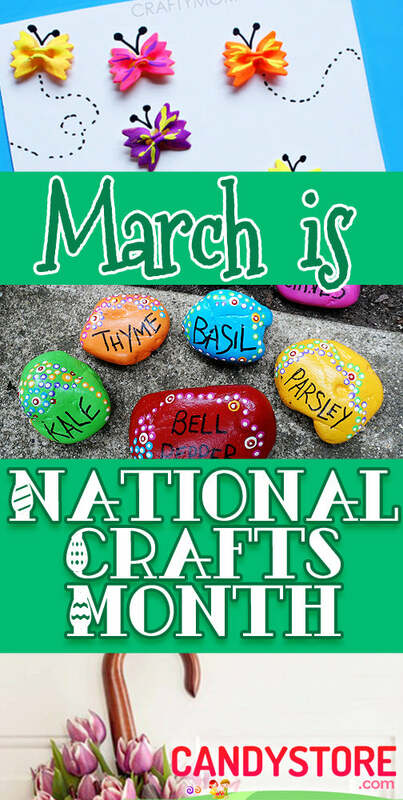 Most of all, have fun with your family and get crafty for National Craft Month!